Nearly 100 percent of former football players will have signs of osteoarthritis – the most common form of arthritis -- in one or more of their joints, says orthopedic surgeon Alejandro Badia MD, an expert in the treatment of diseases of the upper limbs and joints, including disorders related to sports. “That’s because previous traumatic injury to joints – common in football -- plays a role in later development of the disease,” says Dr. Badia, founder and chief medical officer of the Badia Hand to Shoulder Center and OrthoNOW®. He is especially noted for treating joint disorders, including arthritis, in the upper limbs of professional, amateur and recreational athletes. Dr. Badia cautions, however, not to think of arthritis simply as one disease. “The term actually applies to more than 100 different joint-related conditions, and multiple causative factors, including sports injuries and other kinds of trauma, are involved,” says Dr. Badia, who himself suffers from arthritis in the knee and calls arthritis the leading cause of physical disability in the United States. Dr. Badia’s comments come as a reminder that May is National Arthritis Awareness Month. Rheumatoid arthritis is an autoimmune disorder that inflames joints by causing a person’s own white blood cells to attack the synovium, the soft tissue that nourishes and lubricates joint cartilage. “The general misconception is that arthritis just appears in older individuals and primarily impacts the knees and hips. Not true. The disease can occur at almost any age and affect the upper back and neck, shoulders, elbows, wrists and hands, as well as lower limbs,” he says. Arthritis may develop in almost any joint, but, in the hands, arms or shoulders, the disease can prove truly limiting, impacting a person’s ability to perform common daily tasks – even such simple functions as tying a shoe or opening and tightening a jar lid. Surgery may be required to realign and restore function to a hand deformed by arthritis. Arthritis in the shoulder usually will develop where collarbone meets the tip of the shoulder blade. Should nonsurgical options fail, treatment of arthritis in this area of the shoulder might require resection arthroplasty in which a small end-piece of collarbone is removed, Dr. Badia says. For arthritis in the shoulder’s ball-and-socket (glenohumeral) joint, surgical approaches can include standard total shoulder replacement, hemiarthroplasty (half-joint repair), joint resurfacing, and even “reverse” shoulder arthroplasty. “Arthritis is not curable. 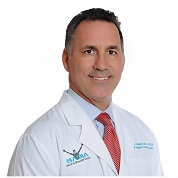 That’s why early treatment is so essential to slowing its progression and avoiding extensive, restorative procedures,” says Dr. Badia, who served as the Orthopedic Medical Honoree for the 2018 Walk to Cure Arthritis in Miami.